See how EHS Insight helps organizations become more effective at managing compliance. Report and track injuries and illnesses in compliance with company, regulatory, and industry requirements, including OSHA, WCB, RIDDOR, and MSHA. Report, track, monitor, and improve all aspects of your occupational health and safety program. Learn more. Ensure compliance with every regulatory, company, and other requirement by planning work in advance by defining your action plans, and using automation to get it done. Easily identify areas needing the most attention and ensure you get improvement in the right places. Learn more. Report and track hazardous conditions and behaviors in the workplace, and ensure the organization is learning from them. Gain insight into company-wide performance related to hazards and behaviors and ensure corrective actions are implemented to avoid recurrence. Learn more. Gather the data you need to measure your organization’s sustainability programs. Key Performance Indicators can be used to easily examine how you are doing. Understand your progress by analyzing the data and evaluating trends. Learn more. Monitor, measure, audit, and review nearly anything related to your management systems and ISO 9001, ISO 14001, and ISO 45001. Be up and running in weeks, and have a complete solution right out of the box. Learn more. Ensure corporate and regulatory compliance, and monitor all aspects of your operations for carbon and energy usage and impacts to the environment, without the hassle of manual systems. Manage permits and associated compliance obligations. Learn more. Automate and simplify Industrial Hygiene sampling and exposure assessment. Focus on the hazards that pose the greatest risks, and mitigate those risks to promote a safe and healthy work environment. Learn more. Identify and manage hazards in real-time, perform risk assessments, and automate the important processes related to each. Roll-up the data to get a global perspective and drill back down to see the local picture, examining each and every significant hazard along with implementation of controls. Learn more. Automate your quality management system to ensure compliance, and monitor all aspects of your operations without the hassle of manual systems. Includes nonconformance reporting, quality inspections, investigations, corrective actions, regulatory requirements, and permits. Learn more. 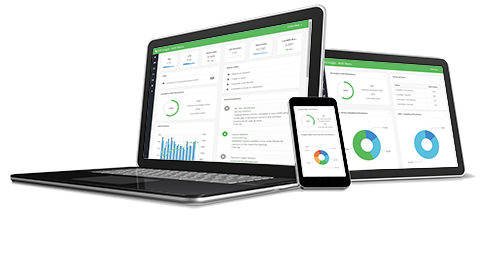 Manage incidents, audits, inspections, risk and compliance. Monitor, measure, audit, and review nearly anything related to your occupational health and safety management system. Focus on proactive measures and programs rather than compliance and data collection. Learn more. Don’t be stuck at your desk. Report, investigate, inspect, and take action from anywhere using a mobile device. Instantly approve and assign work even while away from your desk. You can also work offline, and sync whenever a connection is available. Report, track, monitor, and improve all aspects of your EHS Management programs. Make sure all requirements are met, and that nothing slips through the cracks. With a single integrated system, you’ll always know what is going on. Reduce the burden of data entry on the operational roles, and make the enterprise EHS team more effective by letting them focus on proactive measures and programs rather than compliance and data collection. Good tools lead to good information and good decisions. Everything you need to manage Health & Safety, Sustainability, Risk, and Compliance.